Competitive swim training equipment and products for individuals, swim teams and swimming pool facilities, including Competitor and Anti-Wave swim racing lane lines, backstroke flags, stopwatches, pace clocks and Stretch Cordz and personal swim training equipment. Extensive selection of equipment for your pool deck and surrounding surfaces, including grab rails and hand rails, steps, ladders, starting blocking, lifeguard chairs and dive towers. Manufacturers represented include Paragon Aquatics, S R Smith and Duraflex. Everything for cleaning and maintaining your commercial swimming pool including automatic pool cleaners, leaf rakes and skimmers, pool scrub brushes, vacuum filter and pump systems and underwater cleaning equipment. We offer a wide variety of flow meters, gauges, valves, water level controllers and flow switches for commercial swimming pools. Recreational swim equipment for commercial aquatic facilities including climbing walls, water basketball and volleyball, permanent and portable pool slides, floats and toys, and products for every type of aquatic fitness, exercise and therapy program. All the products you need to ensure safety at your swimming pool including lifeguard and rescue equipment, CPR and first aid kits, pool signage and life vests. Wibitize Your Pool! 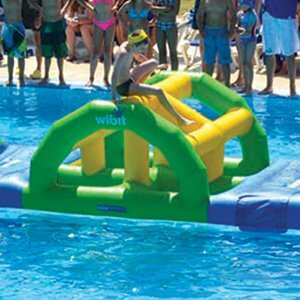 Revitalize and increase visitor numbers with Wibit's interlocking combinations and transform your swimming pool into a water adventure for all ages! TheraBand Aqua Fun and Function is a written guide on achieving functional training with TheraBand aquatics products. Walk-In Counter Closes 5 PM, Mon.- Fri.
Large volume shipping and central location allows us to offer our customers reduced freight costs and fast shipment on orders. Over 40 years of experience! Custom shapes and sizes, and steel pool kits available. Recreonics is not a party to ANY mysterious shopper initiative. Call your Better Business Bureau today.